Renegade Editor’s Note: Please show me one shred of evidence this event even took place. It is quite a coincidence they ran an active shooter drill at a synagogue in Squirrel Hill 9 months prior, right next to Tree of Life. By the way, a gabbai is a synagogue helper. (MPN) — In the wake of the mass shooting at the Pittsburgh Tree of Life Synagogue on Saturday, action has been taken to remove an alternative social media network on which the shooter responsible for Saturday’s massacre, Robert Bowers, had posted. The decision comes not long after a coordinated effort by Facebook and Twitter that deleted hundreds of anti-establishment accounts and pages. 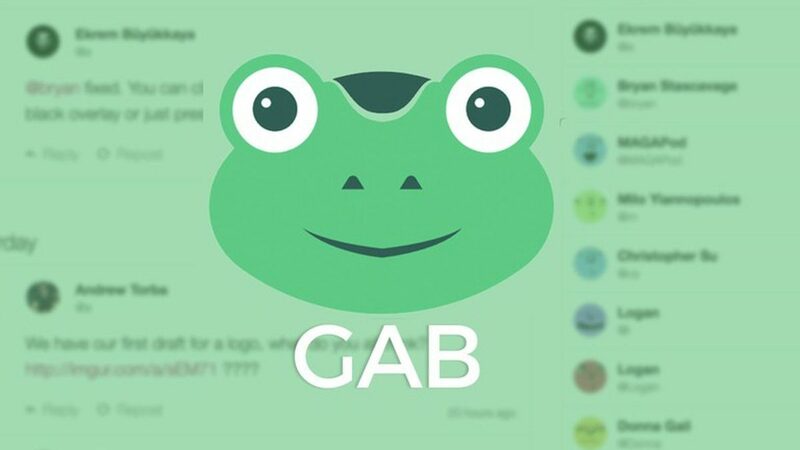 Gab, a Twitter alternative that has thus far been largely dominated by “alt-right” users and those that have been “banned” or “shadow banned” on Twitter, has now been booted by both its hosting company, Joyent, and the domain registrar GoDaddy, after both companies stated that the posts Bowers had made on the social network violated their terms of service. Bowers allegedly posted just minutes before the shooting on the Gab platform, writing “I can’t sit by and watch my people get slaughtered. Screw your optics, I’m going in.” Bowers had allegedly blamed the Jewish people for “committing genocide” against white Americans. Upon learning of the shooter’s account on the platform, Gab deleted the account and backed up the data, which it also provided to the Department of Justice and FBI. In addition, via a statement, Gab disavowed “all acts of terrorism and violence” and said its mission is “to defend free expression and individual liberty online for all people” by offering an uncensored social networking platform. 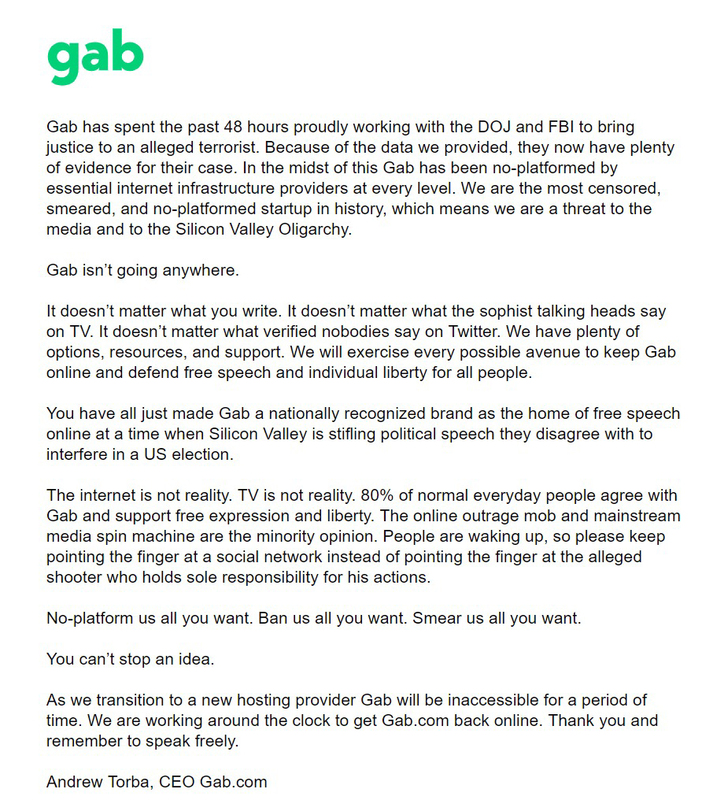 Nevertheless, despite the extent of the cooperation between Gab and the legal authorities, Gab subsequently posted on Twitter that it was “being forced off the internet for the disgusting actions of one man.” Notably, Robert Bowers also had accounts on other social media platforms including Twitter, but those social networks were not targeted for those accounts or any of the posts created by those accounts. Gab’s removal from its hosting provider and domain name registrar could result in the site being down for several weeks, according to posts made by Gab on social media. Currently, the site is inaccessible for users, as the main homepage now only displays a message from Gab’s CEO, Andrew Torba. In addition, PayPal also severed ties with Gab after the shooting, stating that the company was invoking its right to terminate an account “for any reason and at any time” contained within the PayPal user agreement. Notably, PayPal did not state that Gab had violated any terms of service. Instead, it appears that PayPal had unilaterally decided to terminate Gab’s use of the platform. The effort to deplatform Gab followed similar threats from Microsoft levied against Gab in August. At the time, Microsoft was providing hosting services to Gab and threatened to cease those services over two anti-Semitic posts it had identified on the social network. Gab subsequently deleted the offending posts and chose Joyent as its new hosting provider. While Gab’s current user base and its uncensored approach to content are bound to result in controversial content being hosted on the site, the larger context in which its deplatforming occurred has chilling consequences for the public’s free access to information via the internet. On October 11, Facebook deleted more than 800 pages from its platform for “inauthentic behavior,” even though it admitted that the targeted pages had produced “legitimate” content. Facebook defined “inauthentic behavior” as using “sensational political content – regardless of its political slant – to build an audience and drive traffic to their websites.” In other words, the pages were removed for publishing and promoting controversial political content. Soon after, Twitter deleted many of the accounts of pages that had been deleted by Facebook, suggesting coordination between the two largest social networks in silencing alternative voices and perspectives. Following these events, some concerned internet users turned to Gab as an uncensored alternative to Facebook and Twitter. However, the events that have followed the Pittsburgh synagogue shooting show that alternative platforms like Gab – even if they are committed to uncensored content – can still be silenced through pressure from hosting providers and domain name registrars. The deplatforming of Gab sets a disturbing precedent, as it shows that websites can now be targeted outside of social networks if pressure is applied via the very companies that enable a page’s presence on the internet. With the deplatforming of Gab, the self-appointed censors have now shown that their ability to censor spreads far beyond censorship within the dominant social networks to the very internet presence of the sites themselves.